Nightlight Christian Adoptions has been helping women facing unplanned pregnancies place their babies into stable, loving homes since 1959. If you are pregnant and considering adoption for your child, we invite you to browse through our I’m Pregnant Pages. Nightlight is licensed in Colorado, California, Florida, Oklahoma, Missouri, Georgia, South Carolina and in Kentucky. Over 3,000 children have been placed with couples through our domestic adoption programs. The information presented on these pages is general and applies to all domestic programs offered by Nightlight. Of course each state may have varying requirements – particularly with the adoption home study process. We invite you to explore our programs and formulate a list of questions you may have regarding our domestic adoption program. Nightlight Christian Adoptions is committed to having well-educated adoptive families. Adoption education does not begin with your adoption process and end with the placement of your child. Education is an ongoing process. 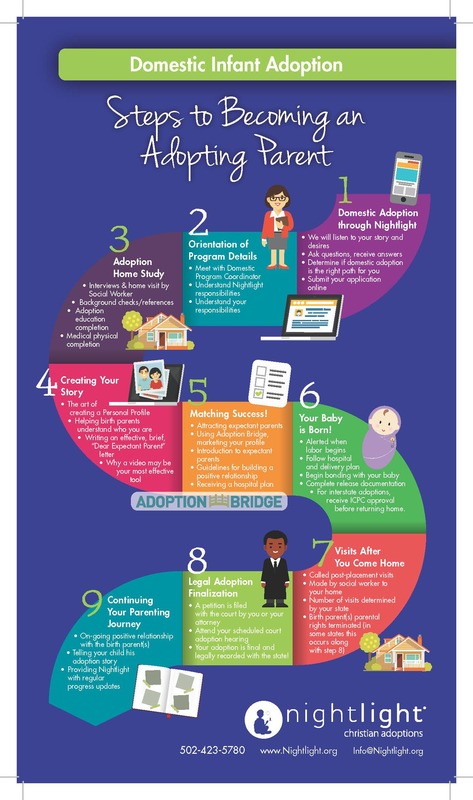 Please read our Adoption Education Requirements for more information about Nightlight’s expectations for families completing a home study or adoption through our agency. If you are looking for parent education opportunities, please view our Upcoming Workshops and Events. To learn more about the domestic program in a specific office, please choose the corresponding link below.